We are well into the New Years Resolution season! This year I am trying something different. Instead of “loosing weight” and “getting healthy” as my resolutions, I am trying something different. I find those resolutions too general and easy to break and abandon. One of my New Years Resolutions this year to eat at home 6 days a week. To some that may seem easy but my family eats out a lot. I blame my restaurateur parents for instilling a love of restaurants in me at a young age. I have started menu planning and we are on track. Another of my New Years Resolutions is to go swimming three times a week. Again, a specific goal that is measurable. This one I am having a bit of trouble with. I know I am not keeping this resolution and I know what I need to do to get back on track and keep this one! 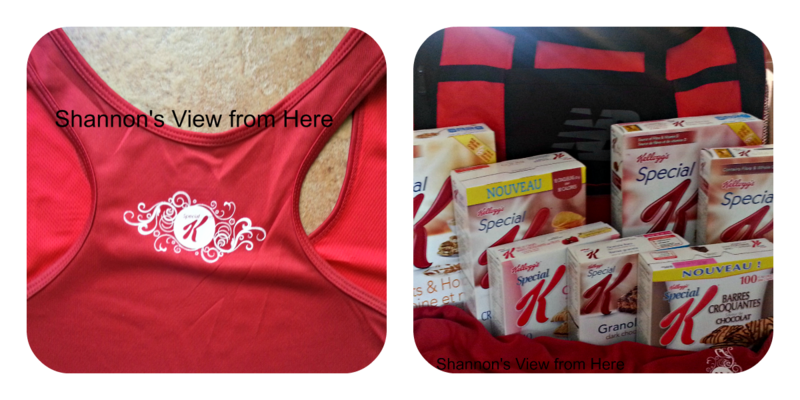 I was very excited to receive a Special K Starter kit! Being a Kellogger sure does have its perks. It is just what I needed to kick start my excitement about my resolutions. A great tool is the Special K plan. The plan is a great tool to help you personalize meal and fitness plans for your goals. There is information on food, fitness, fashion, beauty and tools designed to help you stay on track. There are some fantastic looking recipes too! Along with your Special K plan you will be able to enter some contests and giveaways. You can enter to win a pair of New Balance shows by creating your plan. Also there is a program to redeem Pin Points towards a freeNew Balance Lightning Dry Tank Top, like the one pictured above. Stay positive! A positive outlook will go a long way. Disclaimer: As a part of the Kelloggers Network I was given items to try in order to share my views with you. No payment was sent to me. All opinions are my own. Eating at restaurants is my family’s biggest problem. We exercise and eat very well when I cook at home, but once we’re all out together the love of trying new menu items is the devil on my shoulder. I do love Special K cereals, the fruit and yogurt is my fave! Eating at home is def. a good goal b/c you can control what’s in your meals and cut calories where you want to. Special K cereal is yummy and def a great breakfast. Having a plan is key and it sounds like you have one. I think my family needs to eat more meals at home also. More cost effective and probably healthier in the long run. I am not sure I could swim three times a week. But walking is a much easier goal for me to obtain. Good luck! Looks like a great start!!! Keep up the good work! Love this!! And I love your message, stay positive, it totally works.